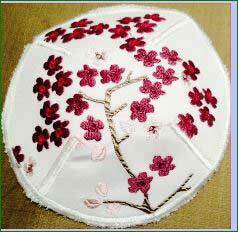 A very special set of a kippah and a challah cover embroidered with your cherry blossom design. 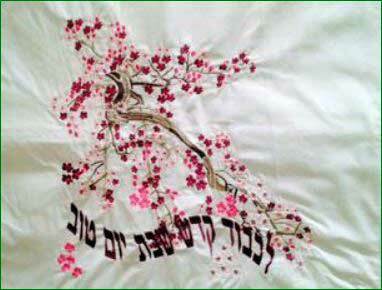 The Bat Mitzvah girl had white Bat Mitzvah invitations with cherry blossoms that were very similar to your fabulous cherry blossom design, and I created the challah cover as a fond remembrance of her Bat mitzvah. 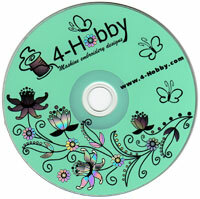 Cotton background with rayon embroidery thread. This is a set and should be considered one entry. She wears the kippah while pronouncing the Candle blessing.